Home / Life at the Manor / Eggs! It’s not that I’ve been terribly busy lately, although I have been kind of busy. I’ve also been suffering from the rapid weather changes and climbing a tower at Gettysburg because sometimes my pride gets in the way of my common sense. No, mostly I haven’t been posting because not much is going on. There’s still not a heck of a lot going on, but to brighten up your Wednesday morning, I bring you eggs! Last night we got four eggs in one day, which is unusual (normally we get two or three) and they are all beautifully identifiable. And, well, they’re just beautiful. 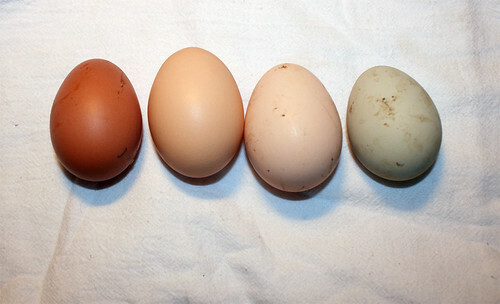 From left to right, the donors of the eggs are Bebelina, Matilda, Lorena, and Ayinnanku. Aren’t the eggs purty? They are nearly as gorgeous as the charming and winsome hens who laid them. A job well done, ladies! Do you sing to dogs?